One of the main reasons why so many cars are stolen is that a thief, even if inexperienced, can force a standard car door lock in a matter of seconds, often using nothing more than a piece of coat-hanger wire. The simplest type of deadlock, such as these Cosmic locks (A), has a swinging arm that fits through slots cut in the door and door pillar. Another design is the Banham lock (B), similar to those used for house doors. It consists of a bolt that moves out to fit through holes drilled in the door and door pillar. In response to the growing number of car thefts, manufacturers both of cars and car accessories have developed a range of devices and techniques to protect your car. But many of these simply immobilize your car. The thief can still break into the car and steal the contents. A cheap solution to this is to fit a set of high-security locks known as deadlocks. These are fitted in addition to the standard door lock, which means you have two locks to undo instead of one. In practice, users often lock just the deadlock and leave the standard lock open. This is just as secure as using both locks. Two main types of deadlock are on the market. One is the rack bolt lock. 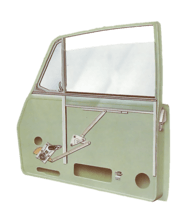 This is usually meant to be fitted to house doors or windows, but many can be adapted to fit to a car. Some manufacturers even make this type of lock specially for fitting to cars - a locksmith will be able to tell you if they are available in your area. 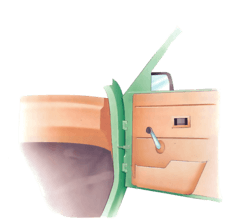 The lock assembly fits inside the door and consists of a supporting tube inside which runs the locking bolt. The bolt has teeth machined along one edge and these engage with a toothed pinion. The pinion in turn engages with the lock, which is operated by a specially shaped key. When the key is inserted and turned, the bolt slides along the tube and emerges and engages with a hole or plate in the door pillar. The other type of deadlock on the market uses a flat metal bar attached to the end of the lock. When the key is turned, the bar turns with it through 90° and locates in a slot in the door pillar. This type is usually operated by a key that looks like a conventional car door key. If you are fitting the arm-type locks, the procedure is similar to that for the rack type. First follow steps 1 and 2 to make the lock hole. Then remove the deadlock arm from the lock assembly and fit the lock. Secure the lock with the locknut. Working from inside the door frame, refit the deadlock arm, then use the key to turn the arm until it just strikes the inside of the door frame. Mark the striking point on the outside of the door frame then drill a hole just larger than the thickness of the arm. Draw a line vertically down from the hole to a point in line with the lock. Then drill a series of small holes on the line. Use a small hacksaw blade to cut out the metal between the holes, and then a fine file to make it into a nice even slot. Check that the deadlock arm swings easily through the slot. Assemble the lock, then hold it up on the outside of the door. Ensure the locking bolt moves out enough to engage successfully with the door pillar. Mark the lock position on the outside of the door. Make sure you do this accurately— once you start drilling holes there is no going back. Stick masking tape over the area where the lock is to fit, then re-mark the lock position on it. Using a small drill, make a circle of holes just inside your drawn line. Cut out the metal between the holes using a hacksaw blade, then use a file to open the hole fully up to shape. Paint the bare metal of the lock hole with primer and topcoat and allow it to dry. Now remove the locknut from the rear of the lock. Fit the lock through the hole from the outside, and secure it in place with the locknut. Make sure any rubber sealing washers are fitted to prevent water getting in. Temporarily assemble the rack bolt and its casing tube to the lock. Move the rack bolt out of the tube until it touches the inside of the door frame. Mark the position where the hole is required, then transfer the mark to the outside of the door frame. You need to drill three holes in the side of the door frame — one large one for the bolt casing to pass through, and two smaller ones for its securing screws. Drill the holes, then fit the rack and its casing through the door so that it passes through the hole in the lock. Secure the casing with screws. With the lock now fitted, close the door and try to engage the lock — it will hit the door pillar. Mark the point at which the lock bolt touches the pillar. Drill a hole in the pillar to match that in the door. Engage the lock and check that the door can't be opened.